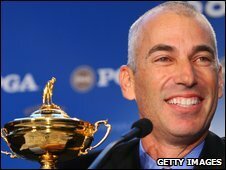 With the next installment of the Ryder Cup just around the corner, United States captain Corey Pavin isn't ready to promise anything to Tiger Woods. According to an article posted on the New York Times website, Pavin suggests that Woods will not be guarenteed a spot on the US Team and wil have to earn his way onto the team just like everybody else. play his way on like every other player, skipper Corey Pavin said on Sunday. is currently 11th in the U.S. Ryder Cup points race. "I'm not going to treat Tiger any different than any other player," Pavin told Reuters after the final round of the Byron Nelson Championship. "He's certainly not going to be an automatic pick. "He's just going to be treated like everyone else. I'd love to have him on the team but I want him to be playing well," added Pavin, who said he had not spoken to Woods this year. In all honesty, I wouldn't hate the idea of Tiger being kept off the team for the sake of not drawing unneeded drama to the event. After all, the United States did just fine without Woods on the roster during the last Ryder Cup, ultimately defeating Team Europe in impressive fashion. Regardless of the "drama factor", Woods might keep himself off the team if his recent stretch of poor play continues in his upcoming tournaments. USGA Wants to Help You, Amateur Golfer!